Yep, that’s right. 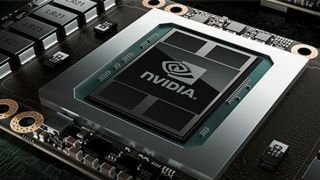 According to the latest report, Nvidia’s next flagship Turing-based GeForce graphics card will be slightly less expensive than a $699 (£699, AU$1,299) Nvidia GTX 1080 Ti. The Nvidia GeForce RTX 2080 may cost $649 (about £510, AU$890) according to information posted on Baidu from a user who claims to be familiar with an undisclosed board partner’s plans. This information isn’t coming from a direct insider source, so these latest rumors are starting on a pretty shaky foundation. Such a low price would be shocking, especially compared to the astronomical prices of Nvidia's other Turing-based Quadro RTX graphics cards. That said, we’re holding out a little hope that the rumor is true for the sake of our collective wallets. The same source also claims the Nvidia RTX 2080 will feature 3,072 CUDA cores running at 1,920MHz with the potential of overclocking up to 2,500MHz. This new GPU will supposedly be faster than the Nvidia Titan V and, at least on paper, it seems to have the specs to beat the flagship Volta graphics card's rated 1,455MHz boost clock – though not the Titan V’s 5,120 CUDA core count. The Nvidia GTX 1080, meanwhile, features 2,560 CUDA cores and a boost clock of 1,733MHz. Will Nvidia release an GeForce GTX 1180 alongside the RTX 2080?